Hi Friends! 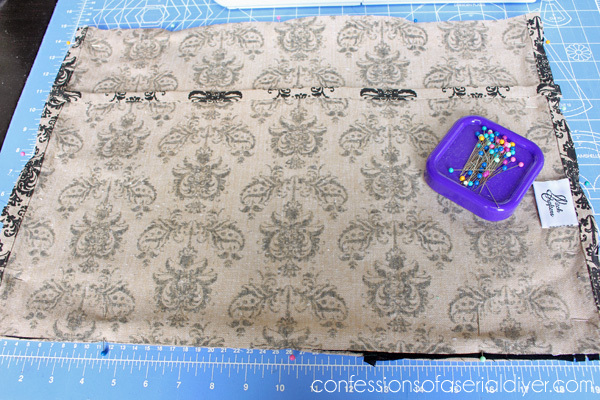 I’m back with a much simpler sewing project today! 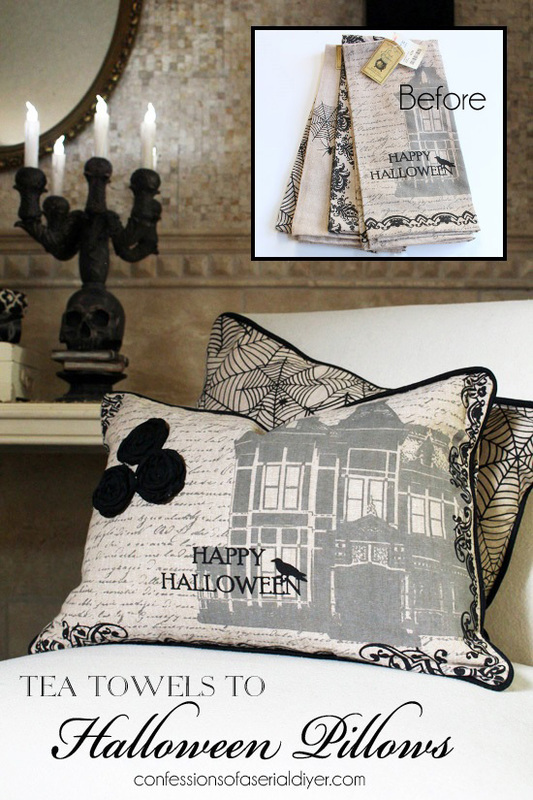 I’m sharing what I did with these fun Halloween tea towels I found at Homegoods last year. 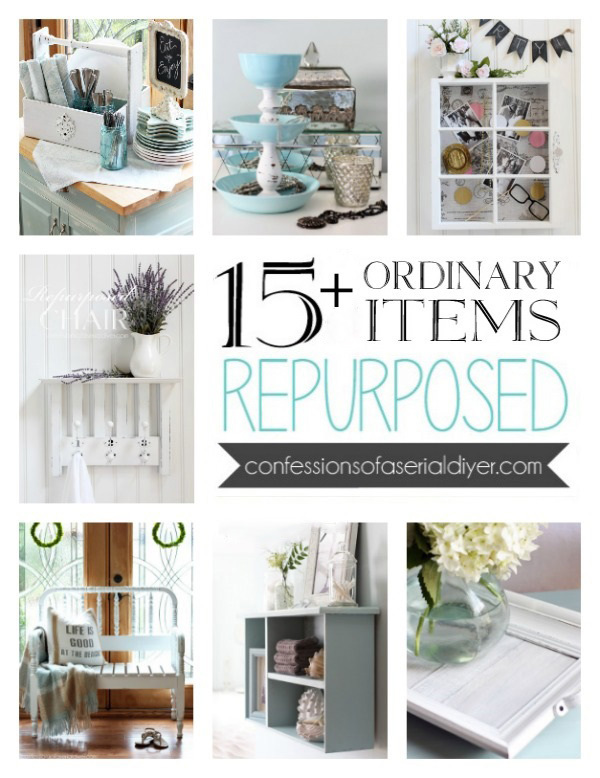 I originally shared this project on another blog as a contributor then, but never got a chance to share it with you! We love Halloween at our house. Every year we each get to pick something new to add to our Halloween display. You can see our Spooky Outdoor Halloween Tour from last year here. 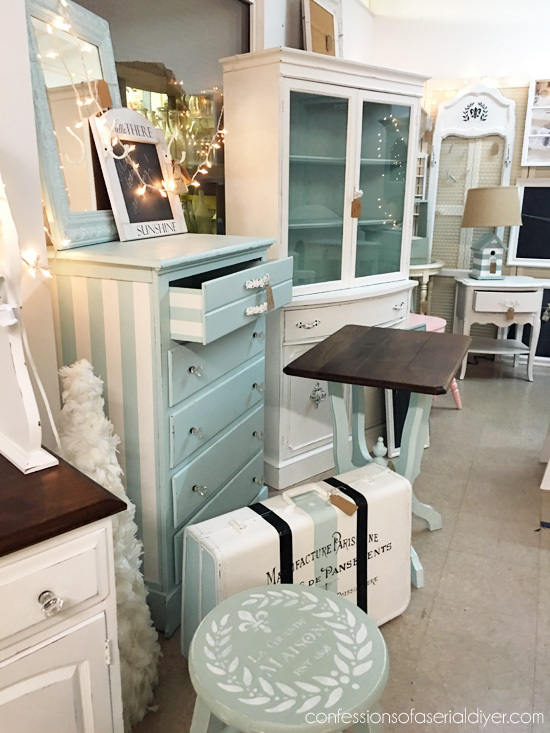 We put a LOT into our outdoor display, but adding a little seasonal décor doesn’t have to be expensive. 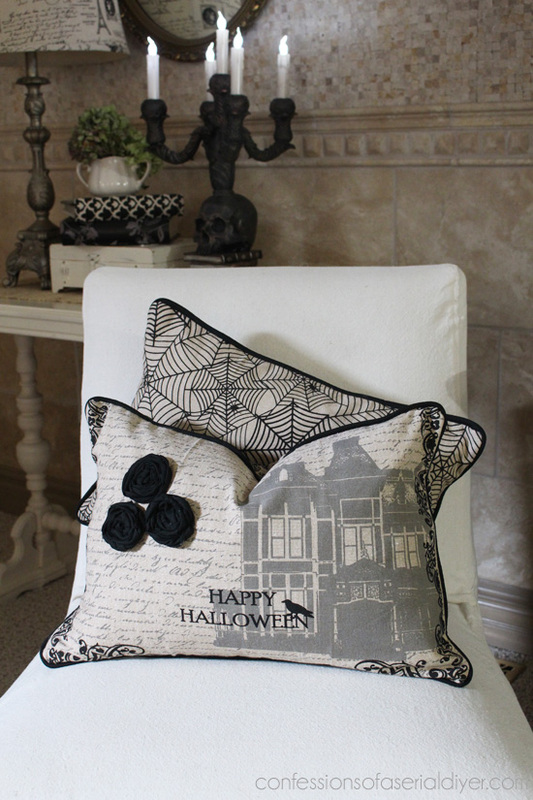 I also had these pillows stashed away in my garage that I found at a yard sale for $3 for the set. They were like new, and I knew the down inserts would come in handy eventually. These have a tendency to shrink quite a bit and I needed them to be this width, so I purposely did not preshrink them. I will have to lay them flat to dry. 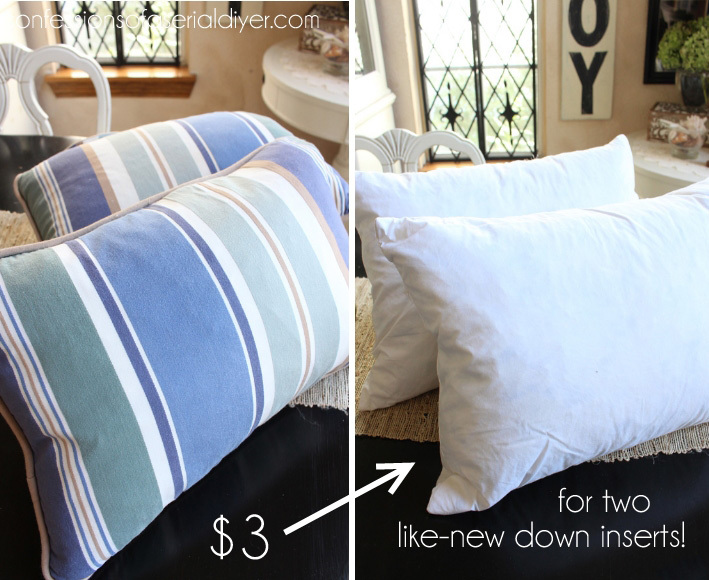 To turn my towels into pillows, I started by cutting them for the first pillow to the dimensions I needed. The pillow forms measure 14″ X 20″. The tea towels are 20″ across also…perfect (& also why I was afraid to wash them). For the fronts of the pillows, I cut the towels the same size as the inserts as I like them to be snug-fitting: 14″ X 20″. 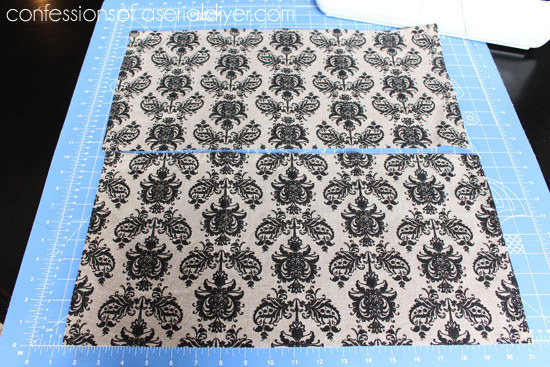 To make the piping I cut the black fabric into 1 1/2″ strips. Then I sewed the strips end-to-end until I had one long strip. 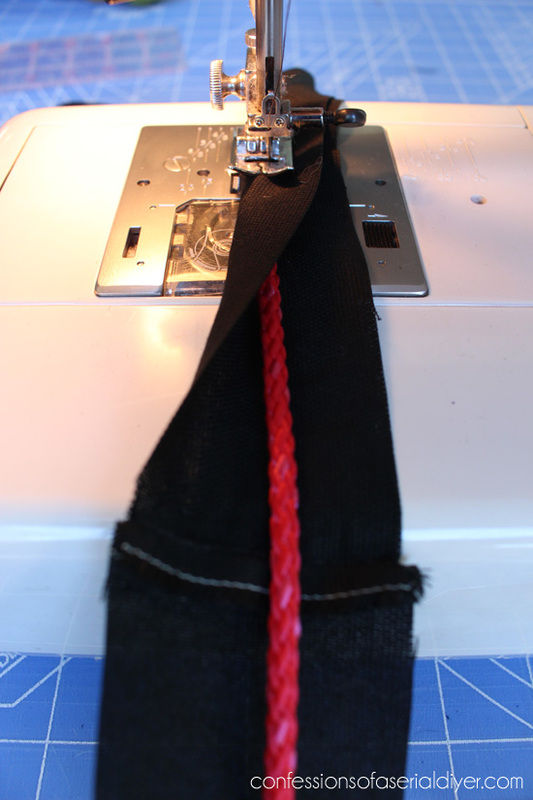 Next I folded the strip over the cording and sewed close to the edge of the cording. I used red because it was what I had. I would normally choose white. I also did not use a piping/zipper foot since I didn’t have one at the time, so no worries with a small project like this if you don’t have one either. Sew along the edge of the piping all the way around. 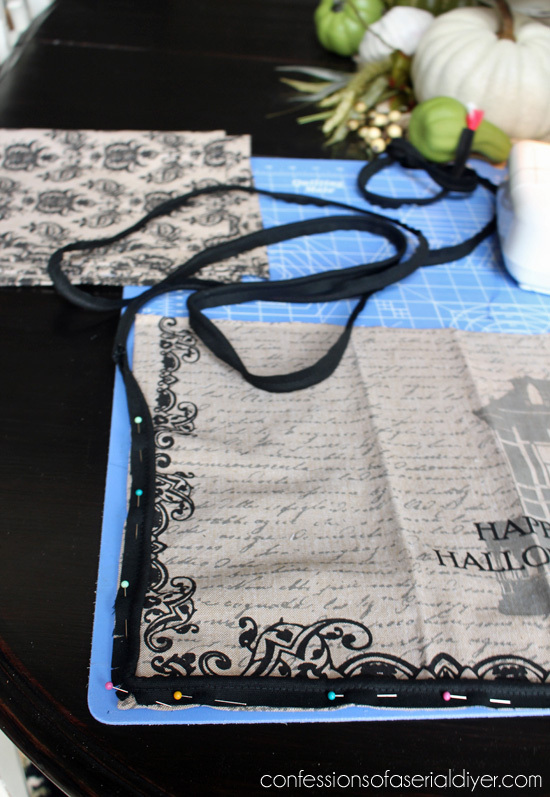 …So that you can easily pull them out when you flip it over to sew. 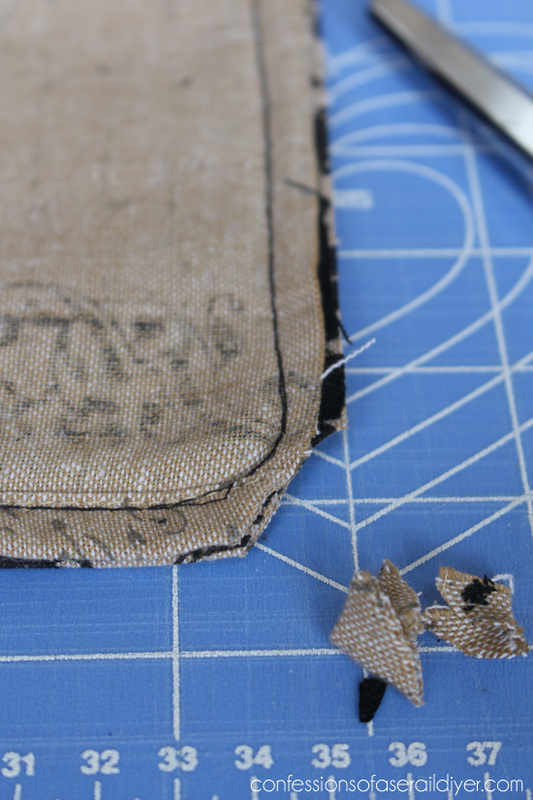 Flipping it over to sew allows you to see the original seam where you added the piping. 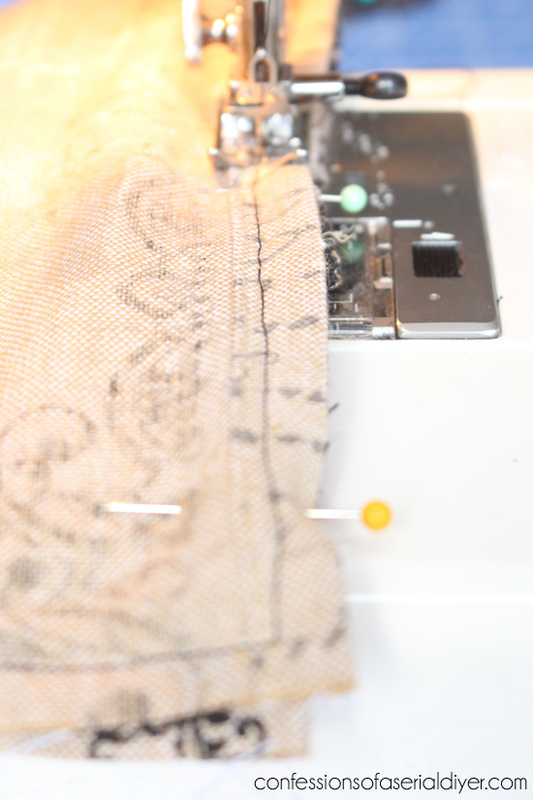 Following this seam will ensure you don’t catch the piping in the seam! Turn right-side-out and insert your pillow forms. 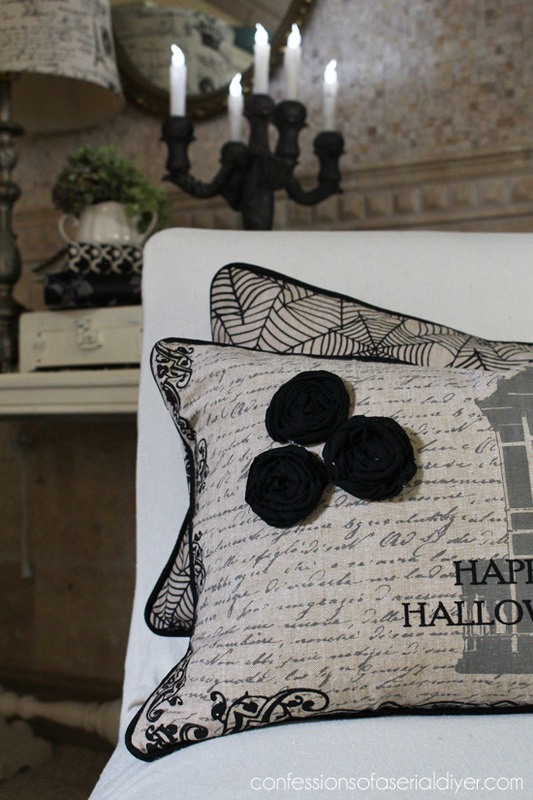 I also added three rag roses with the leftover black fabric to one of the pillows. 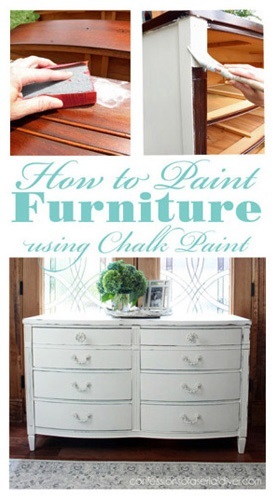 You can find the how-to (including a video!) for these rosettes here. 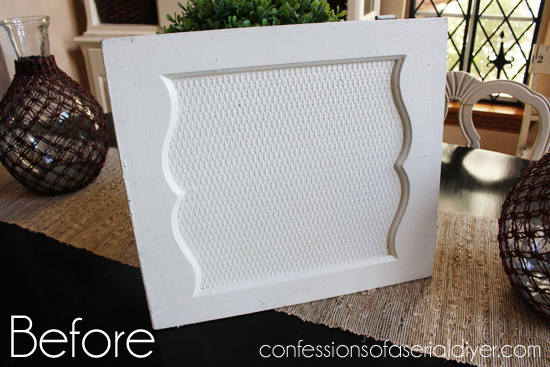 This opening makes it easy to insert and remove the pillow forms. 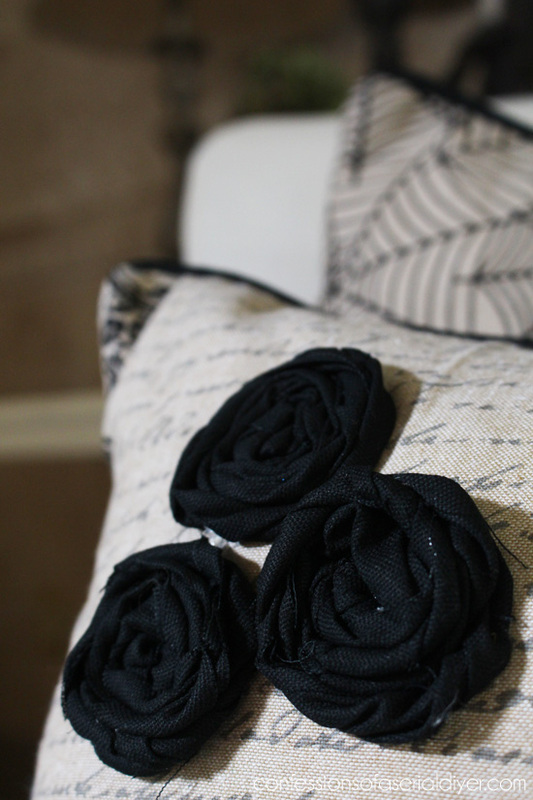 I already had the black fabric left over from my starfish stamped pillows, and I had the cording also, so these pillows cost me just $5.50 each! 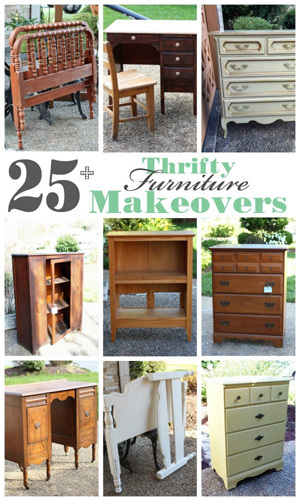 Here’s another Halloween Upcycle from last year that you might like. 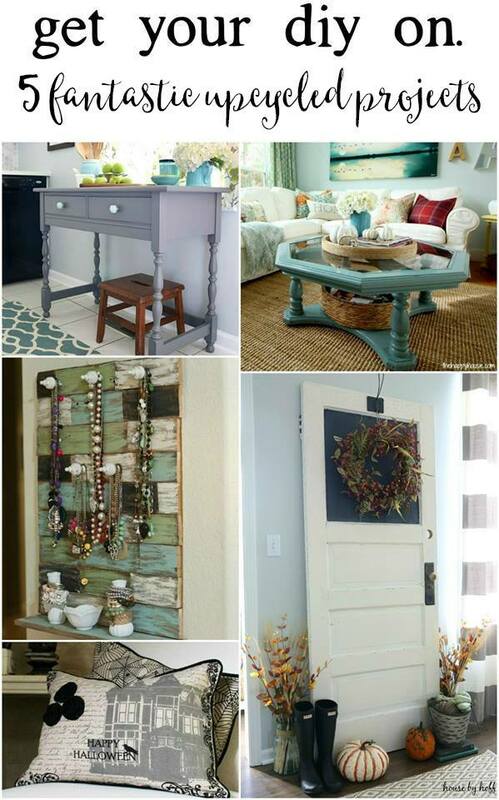 Check out how I turned this old cabinet door into a wreath for my front door! The party fun starts this Sunday, October 4th, at 7:00pm EST. 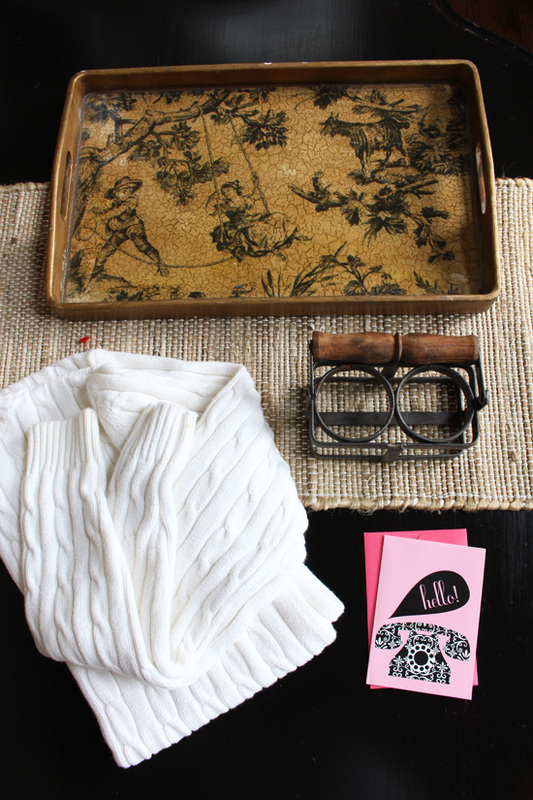 Can’t wait to share what I did with the sweater and the metal thingy. Still working on the tray! Have a great weekend…we’ll be waiting out a Hurricane! 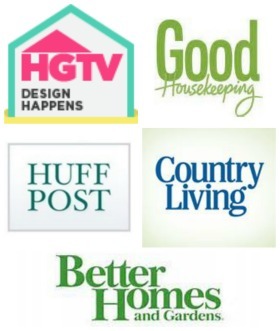 You shouldn’t merely have your own blog….you should have your own TV show! You are one amazing woman! Love the pillows….love all you do! Bravo!! Love this project – using the tea towels this way was such a great idea. Making your own welting?? You have my respect. Thanks for showing us how. 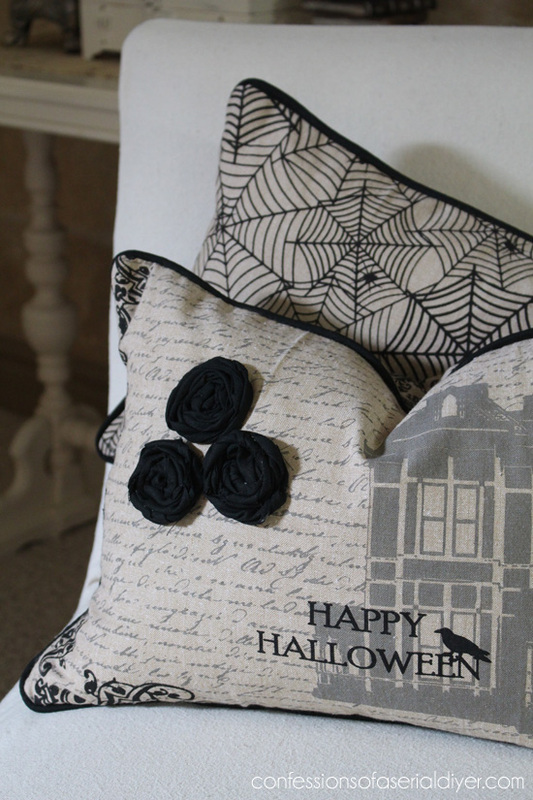 Your Halloween pillows are very cute & I think your instructions are very clear. My sewing skills are not great but I think these pillows are something I can handle. Thanks for the cute idea. I follow so many boards and sites and blogs, but the one I can’t wait to see every day is yours! You have such terrific ideas, and your clear instructions make them all seem within my capabilities. Thank you! Hey Christy, Those turned out awesome. 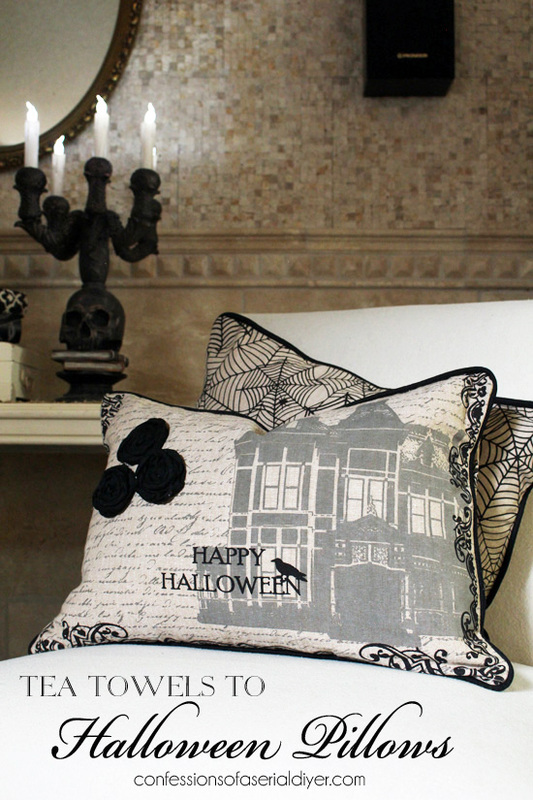 The piping really makes the pillows pop! Thanks, Doug! I agree…September flew by! Very information tutorial. 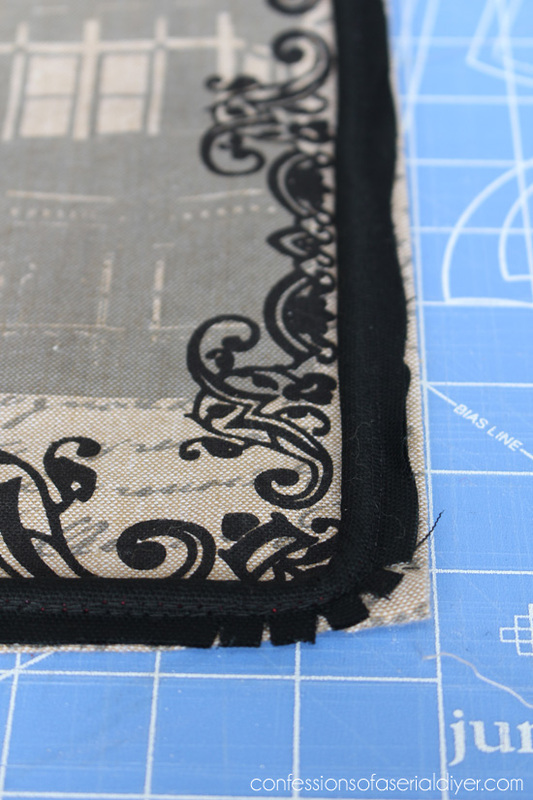 I sew a little, but always get messed up with piping. You make it look easy! Awesome tutorial Christy! 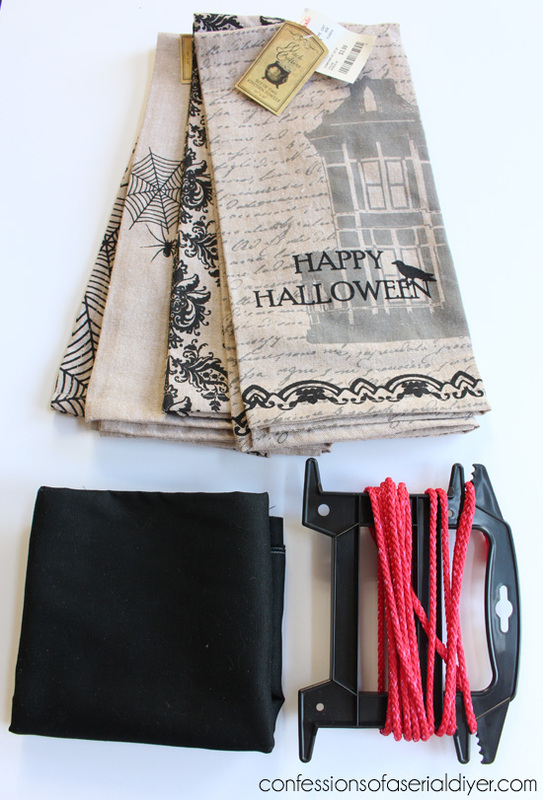 I really like the tea towels you choose – Halloween yet so pretty. I remember your amazing Halloween House from last year – looking forward to seeing what you’ll be adding this year. Love these, Christy! You make it look so easy! 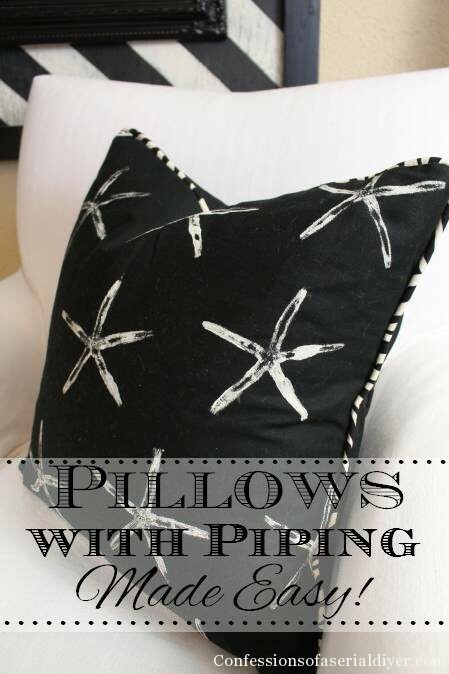 I need to try piping– it looks so great on your pillows! Have a wonderful weekend! Thank you, Sweet Friend! 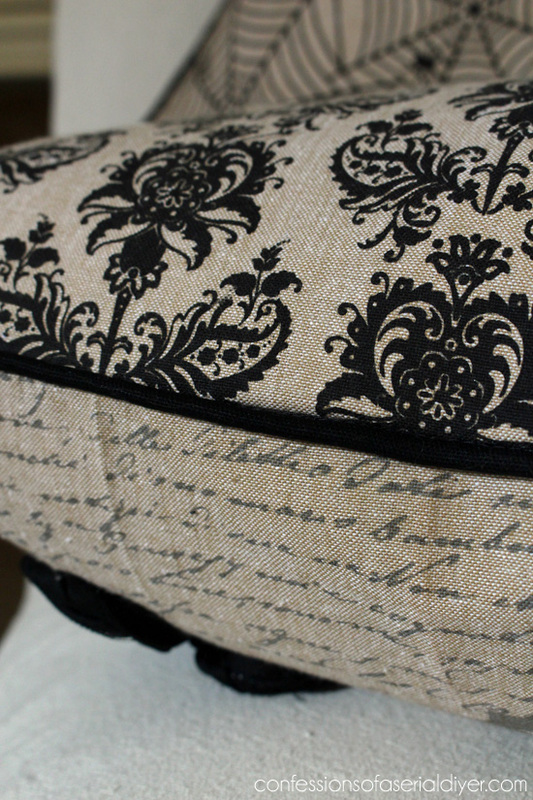 The piping does add a nice finished detail, and it’s not too hard to do. Enjoy your weekend too! We thought we were bracing for a hurricane tomorrow, but woke up to sunshine today! Thanks for the great tutorial and the encouragement to make the piping! 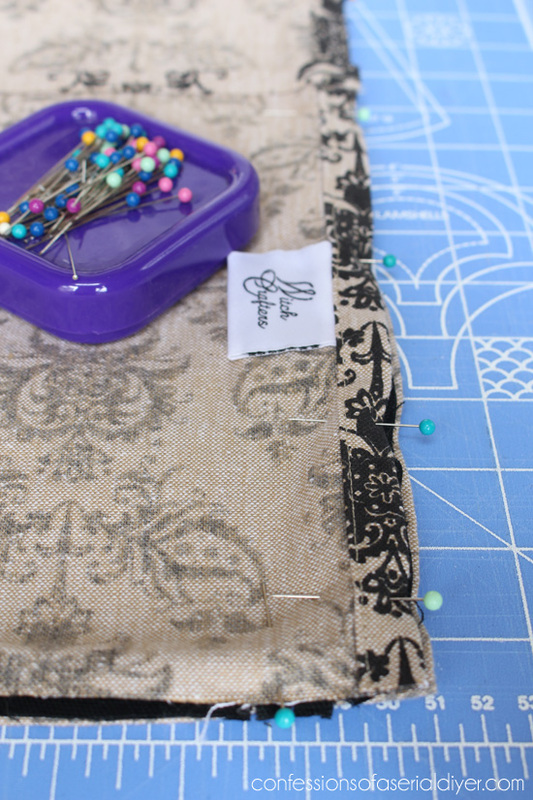 I’ve made a few pillows without piping , even though I have all the supplies to make it…I’m going to now! My new point driver came yesterday I’m so excited…no more “floppy” back boards! Have a nice weekend! The piping! Wow!! I really have to learn how to do that. 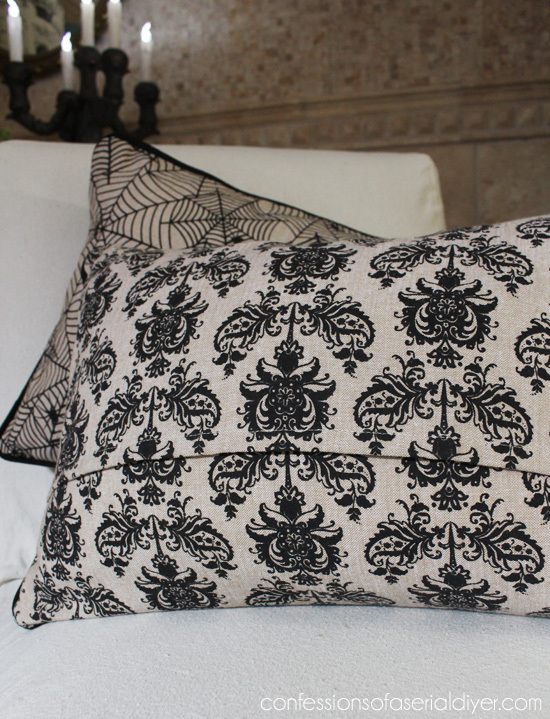 These pillows look amazing – like you could have bought them at a high end retailer! Brilliant. 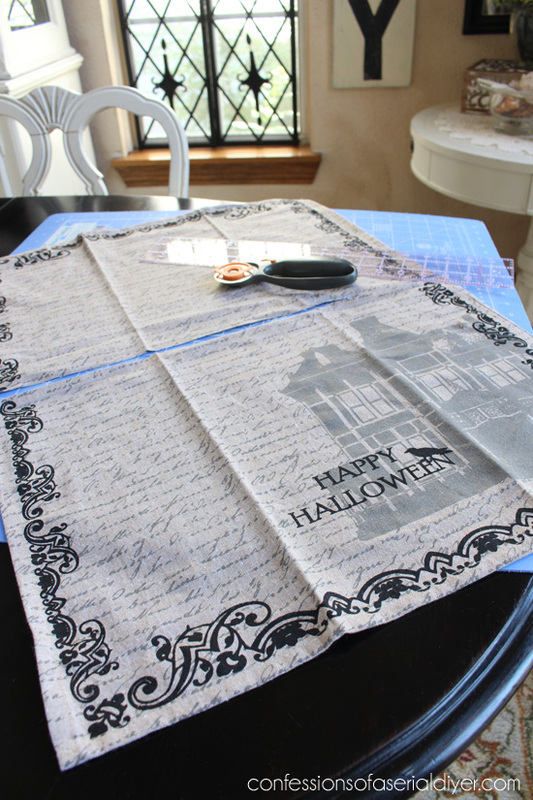 The tea towels are so cute, and perfect for Halloween! Great project, Christy!